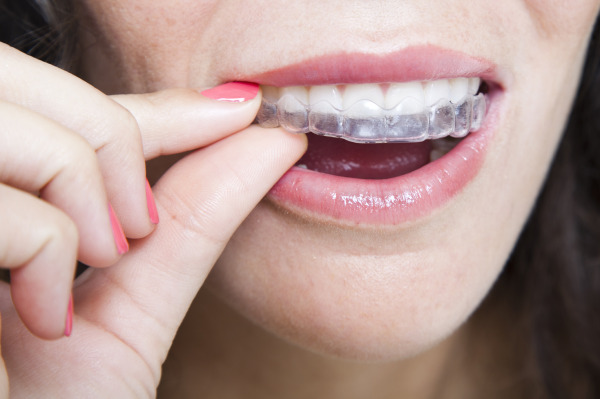 Invisalign® is a modern, advanced way to straighten teeth. In the past, the most common way to properly align teeth was with metal braces. However, many consider metal braces to be painful and embarrassing. Invisalign® braces are made from invisible, smooth plastic, which makes them impossible to see and comfortable to wear. For patients seeking teeth straitening treatment with Invisalign® in Allentown, Dr. Kumar is a certified Invisalign® dentist who is able to help you meet your goal smile comfortably and easily. When you opt for clear aligner therapy with Invisalign®, molds of the teeth will be taken at your initial consultation and used to create a custom-fit series of plastic trays. The planning process for your clear braces is simple and comfortable. Once treatment begins, there are no metal pieces or wires to tighten, as with traditional metal braces. Every few weeks, you will receive a new set of clear trays to wear until your teeth gradually shift into goal alignment. Anyone who has crooked teeth or tooth crowding problems will benefit from treatment with Invisalign® in our Allentown dental office. Clear braces are hard to detect, so few people will be able to tell that you’re undergoing treatment. This method is ideal for teens who are concerned about their appearance while working to straighten their teeth, or a professional worker who deals with the public on a regular basis. • No down time for planning and undergoing treatment - You will be able to return to work immediately after beginning to wear your first aligner tray. • Near invisibility - The smooth plastic aligners are subtle and will not irritate sensitive tissues in the mouth. • Removability – Because the trays can be removed for brushing and flossing, you can maintain the same at-home oral health routine. Oral care is not as simple with metal braces that remain on teeth for years, are difficult to clean around, and can lead to decay. While wearing metal braces means that patients must avoid a long list of foods, Invisalign® is removable and lets you maintain the same diet as before treatment began. Not every dentist specializes in Invisalign®, but Allentown patients can trust Fairmont Dental for comfortable teeth straightening with Invisalign®. Dr. Kumar is a trained cosmetic dentist with over a decade of experience. He is always learning the latest technologies to help patients achieve the best smiles possible. To schedule an appointment for treatment with Invisalign® at our Allentown dental office, contact us today!